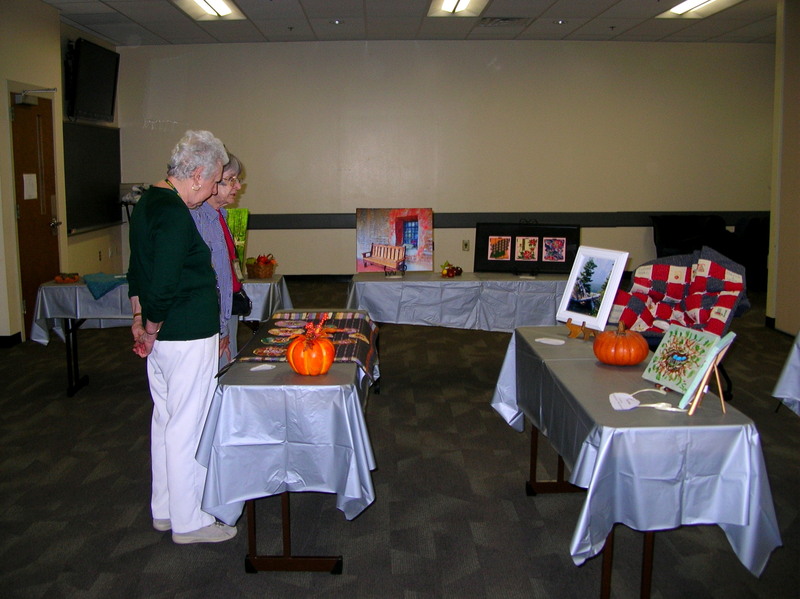 LLI members proudly displayed their work at the 2013 Arts & Crafts Exhibit. 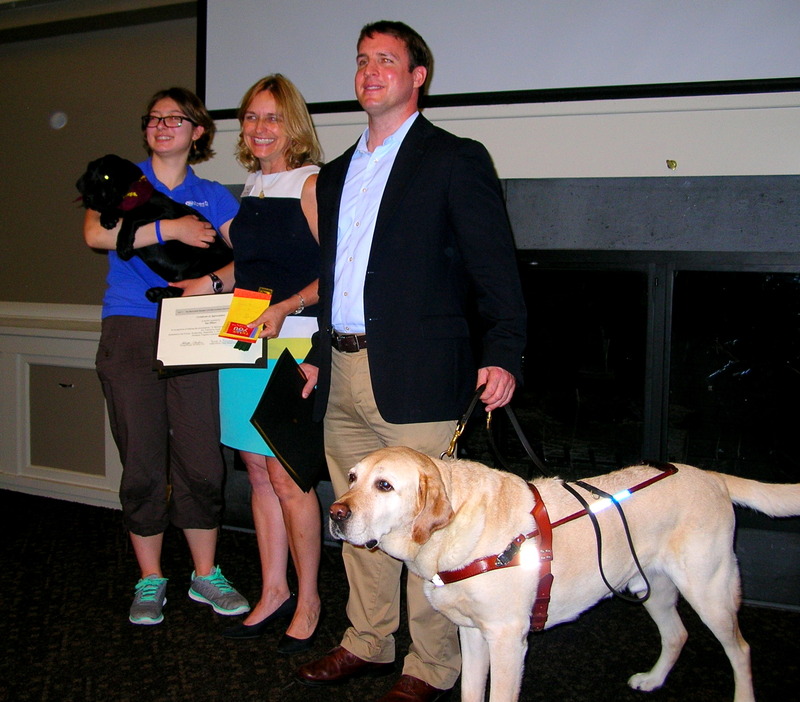 Members of “Guiding Eyes for the Blind,” a New York-based non-profit which trains guide dogs, shared their inspiring mission and wonderful dogs with LLI at the 2014 September Forum. 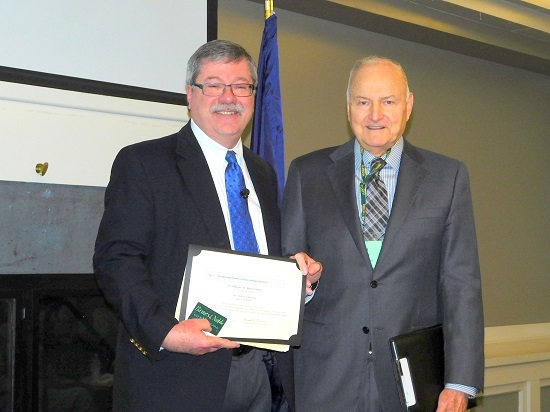 LLI President George Chalou thanks political analyst Bill Schneider for his thought-provoking discussion about a divided America at the February 2015 Forum. 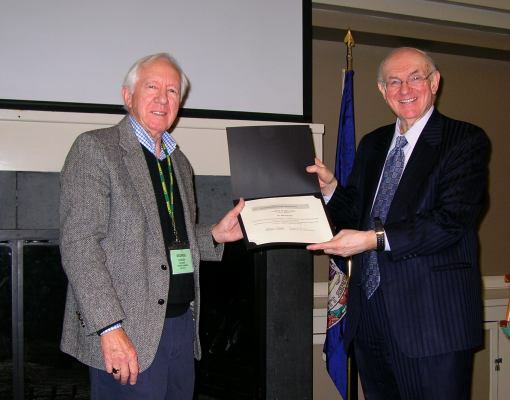 At the January 2015 Forum LLI President George Chalou gave Dr. Jim Zimbelman from the Smithsonian Institution a special thanks for braving the bad weather to give us his informative tour of our solar system. 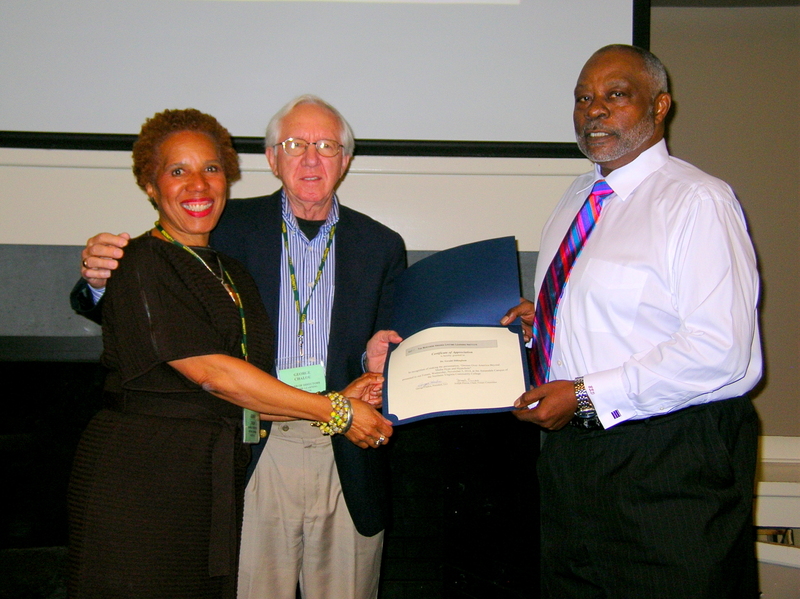 At the March 2015 Forum, Dr. William Gilcher--a writer, filmmaker, and producer--provided a thought-provoking lecture about using culture to resist oppression. 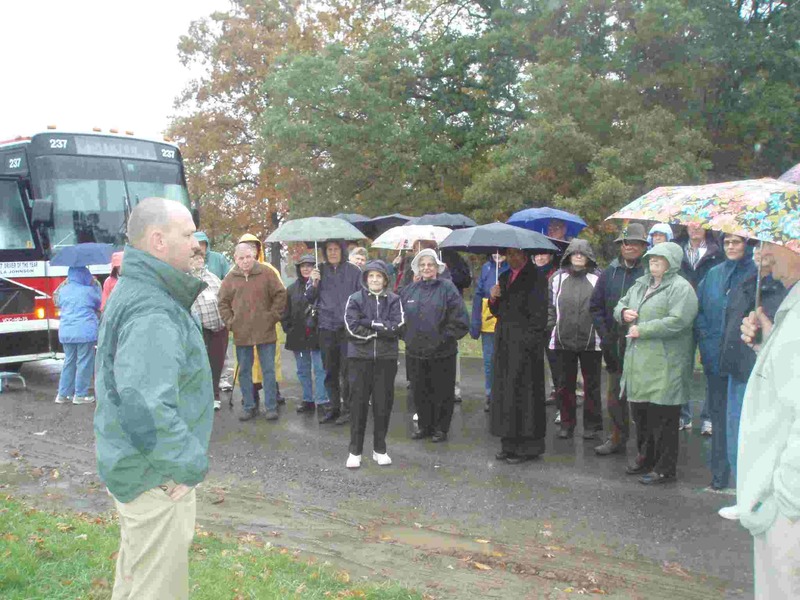 LLI folks in 2013 Dunbue River tour. 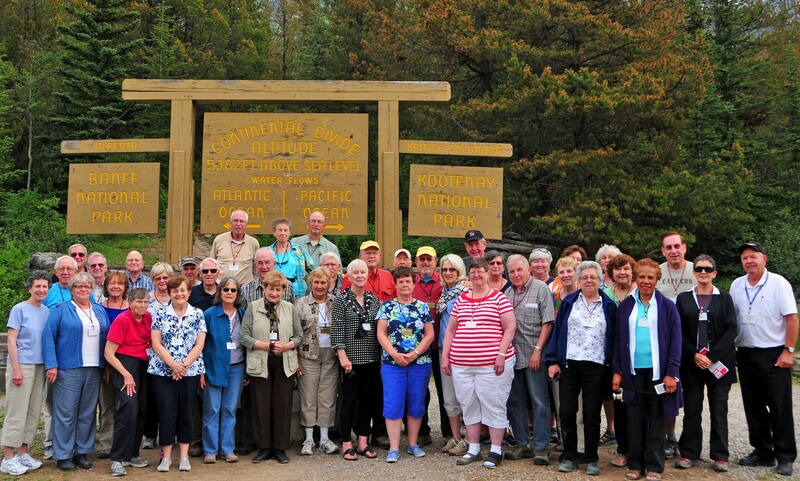 LLI folks at Vermilion Pass, Banff on the Northwest Park tour. 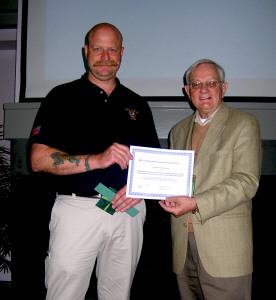 The Battalion Chief of Special Operations for the Fairfax County Urban Search & Rescue Team (Virginia Task Force 1) receives thanks from the President of LLI after his most interesting and inspiring presentation to LLI members at the May Open Forum. 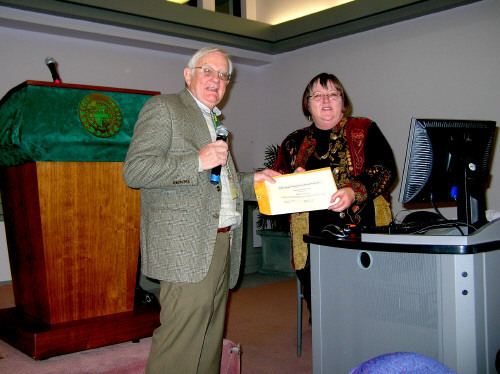 LLI President Paul Hopler thanks Ms. Barbara Ferguson, Washington Bureau Chief of Arab News, for her enlightening discussion of Islam at November’s 2010 Forum. 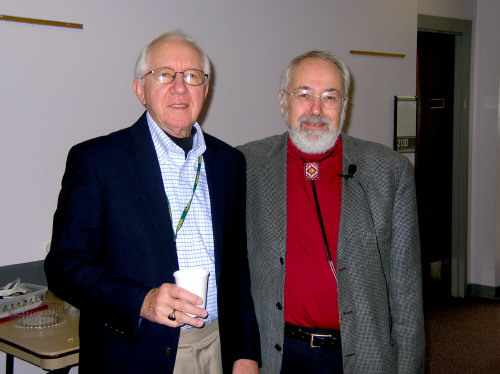 LLI board member George Chalou and Dr. Herman Viola, who provided an informative and lively untold history of Custer’s Last Stand at the January 2011 Forum. 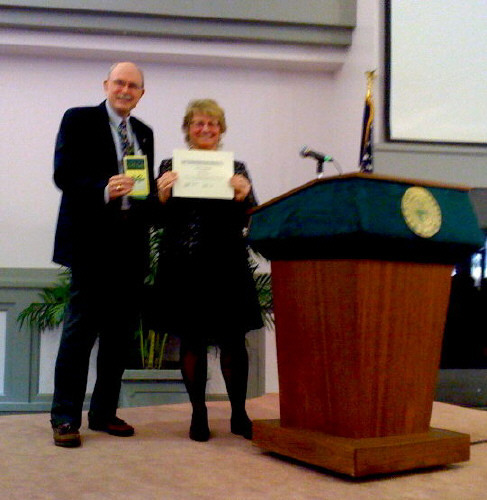 At the February 2011 Forum, LLI President Paul Hopler thanks guest speaker Barbara Tuceling, Director of the Smithsonian Institution’s Associate and Resident Associate Programs. 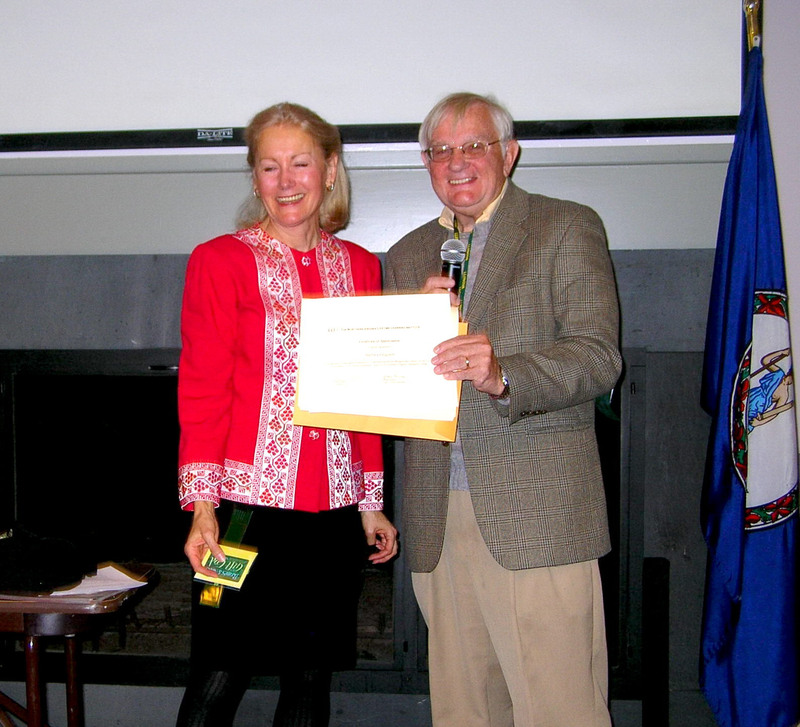 At the March 2011 Forum, LLI Vice-President Bob Huley thanks author Kristin Downey for her informative and entertaining presentation on Frances Perkins, Secretary of Labor during the Franklin Roosevelt administration. 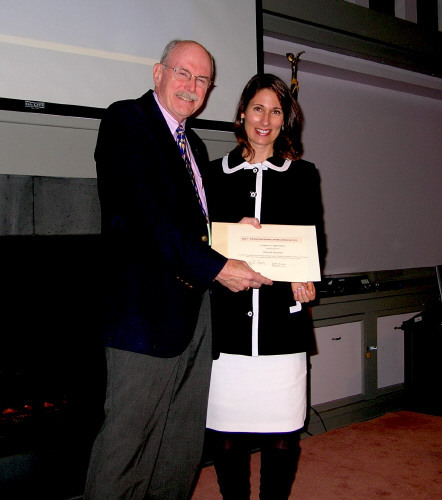 At the April 2011 Forum LLI Vice President Bob Huley thanks The Honorable Deborah Hersman, Chairman of the NTSB, for her excellent presentation on current transportation safety issues. 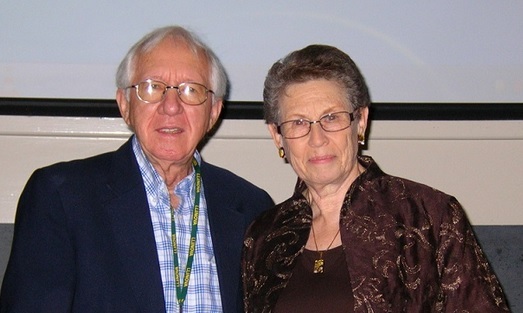 LLI’s Forum Chair, Joseph Pincus, welcomes Kathy Gold, who provided valuable information about the latest research on diabetes at the May 2011 Forum. 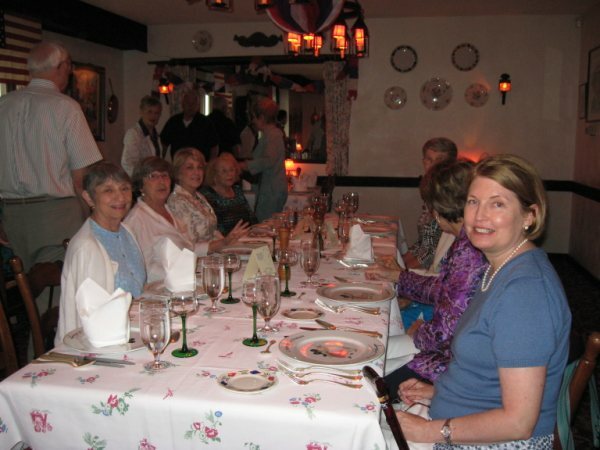 Twenty six LLI Gourmands celebrated Bastille Day in fine Gallic style at L’Auberge Chez Francois in 2010. 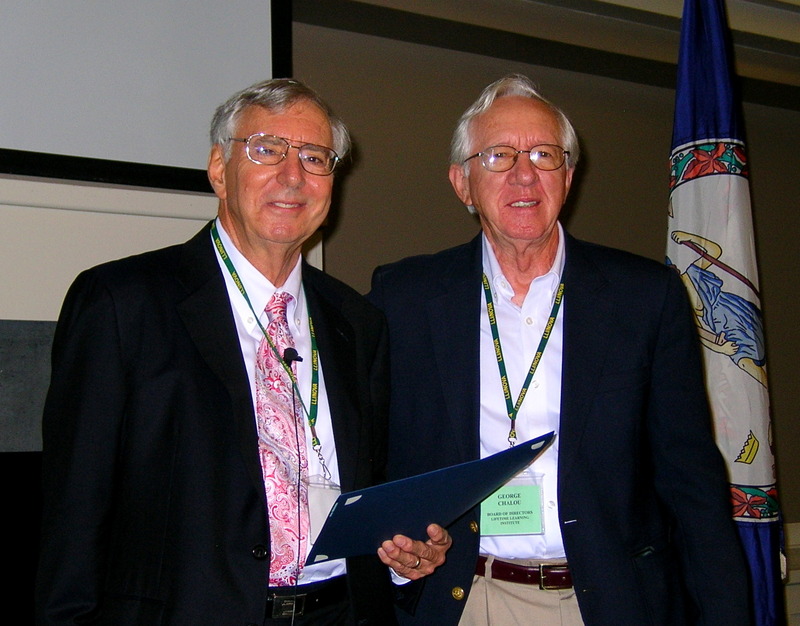 LLI President Paul Hopler thanks Dr. Robert Templin, President of the ten campuses and centers of Northern Virginia Community College, for his address to LLI members at the June 2010 Forum. 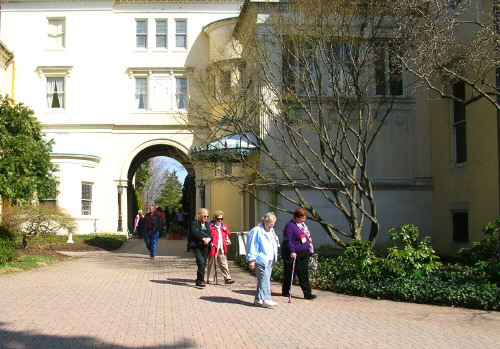 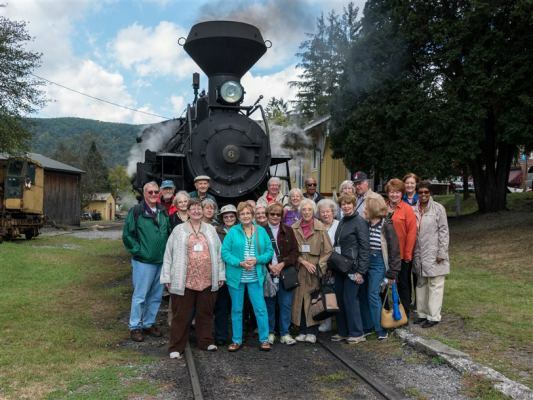 In March, LLI members enjoyed a day trip to the Gilded Age mansion “Evergreen” in Baltimore. 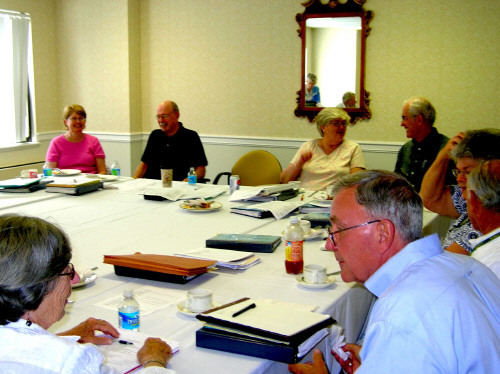 LLI members enjoyed a trip to Princeton and Trenton, New Jersey in June 2011. 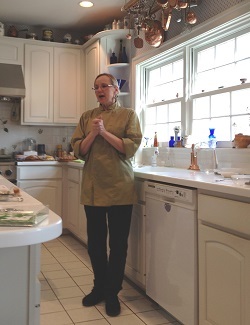 Chef Laurie Bell (shown above) educated several LLI members on the history and taste of tea at her home on March 14. 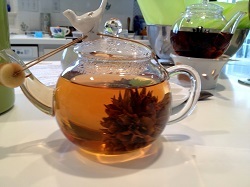 The other picture shows how you can make "blooming" teas. 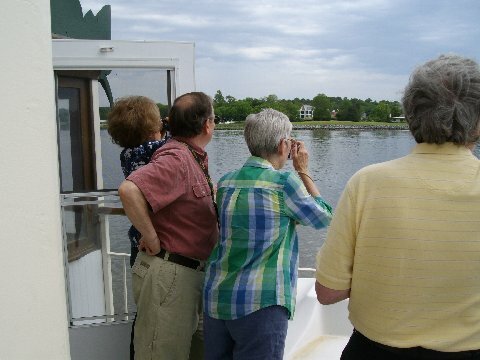 LLI members checking out activity on the Choptank River as they cruise on a paddlewheel boat near Cambridge, Md. 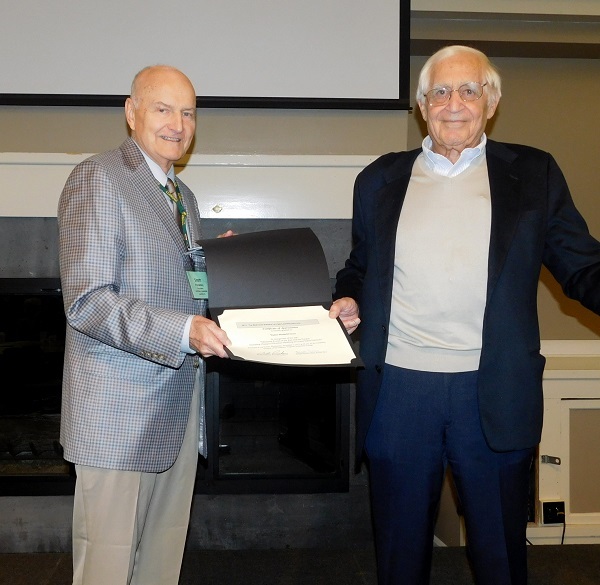 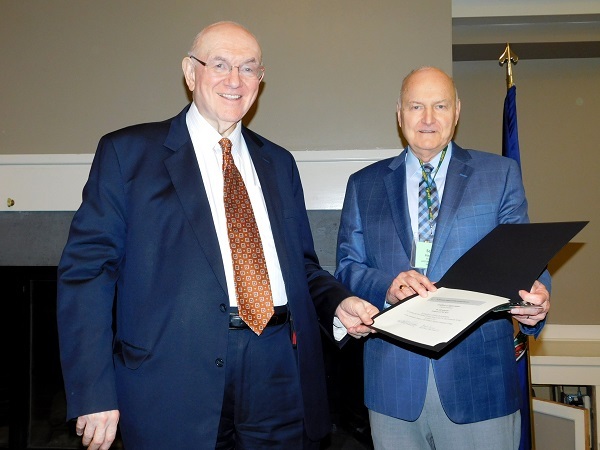 LLI President George Chalou (r) thanks LLI member Joseph Pincus at the October 2014 Forum for his thought-provoking and entertaining talk about how the Internet is affecting our brains. 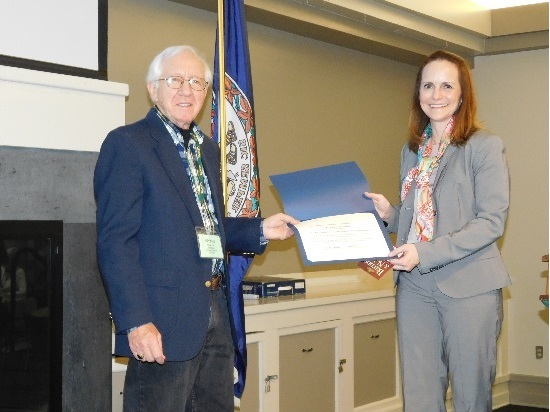 LLI President George Chalou and member Anna Dixon thank Dr. Gerald Dillingham (r) of the Government Accountability Office for his outstanding presentation on unmanned aerial systems (aka “drones”) at the November 2014 Forum. 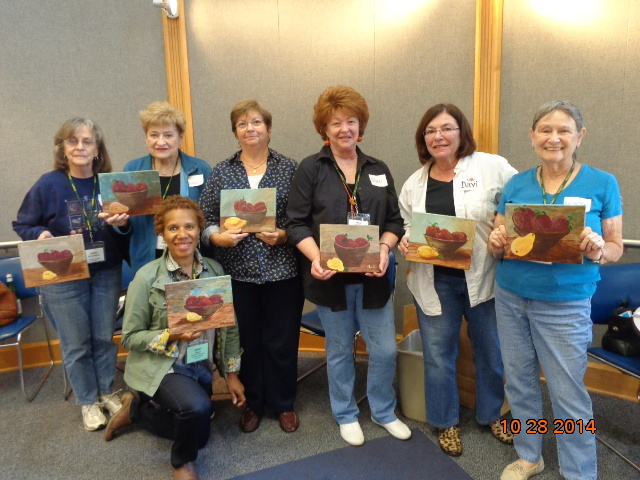 The artists! 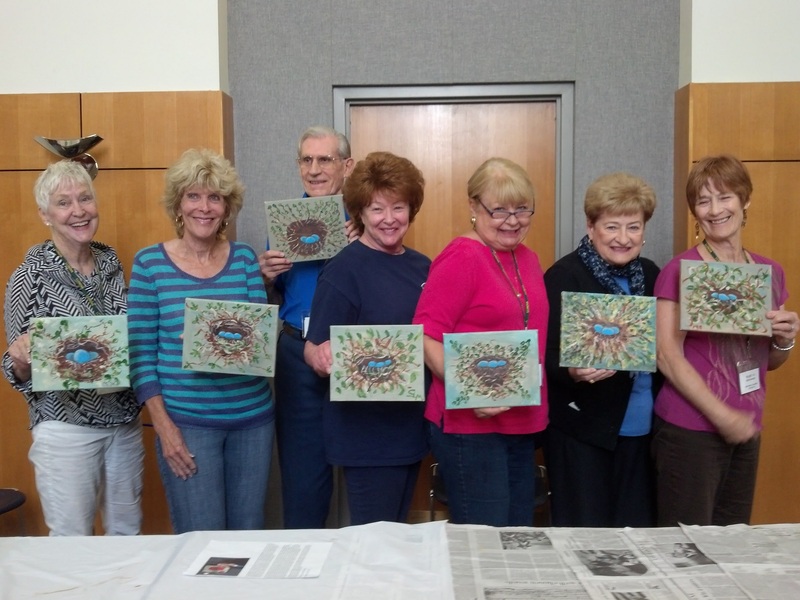 Working with instructor, Davi D’Agostino, LLI members had big fun painting their own acrylic masterpieces in just a single class session. 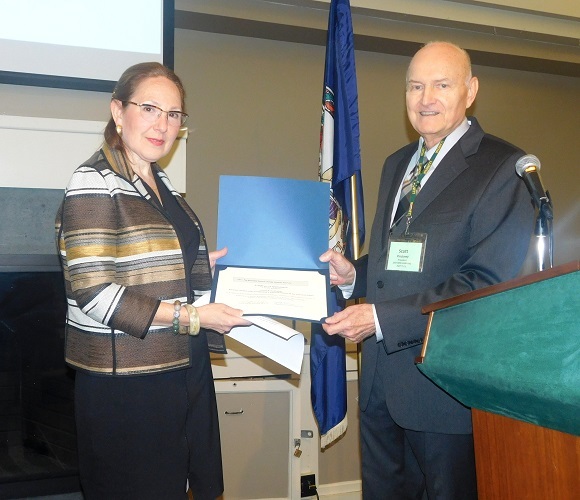 At the April 2015 Forum, Ms. Kirstin Downey shared her intriguing insights about the motivations and place in history of Queen Isabella of Spain drawn from her book Isabella: The Warrior Queen. 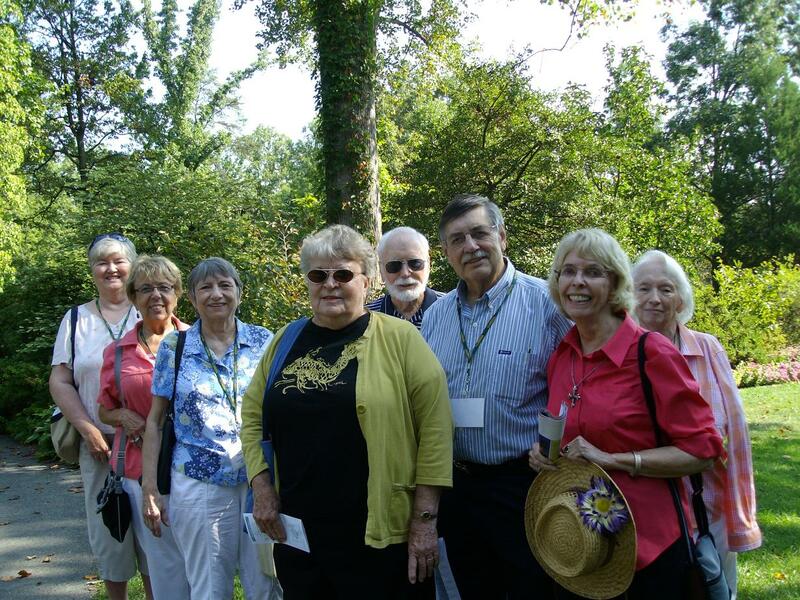 Some of the LLI members who toured the Brookside Gardens. 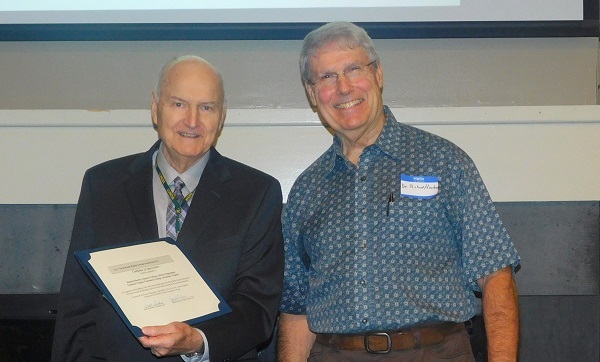 At the June Forum, LLI’s own Conne Rubinstein (here with President George Chalou) provided helpful tips on how to create informative and technically sophisticated video travelogues. 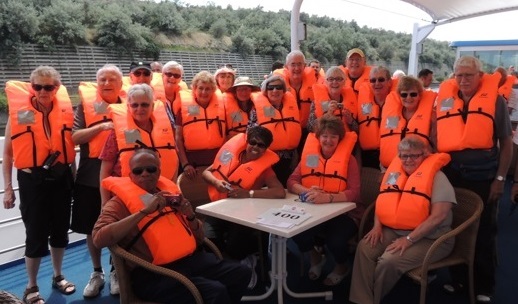 She then showed her delightful video travelogue of the LLI Baltic Sea cruise. 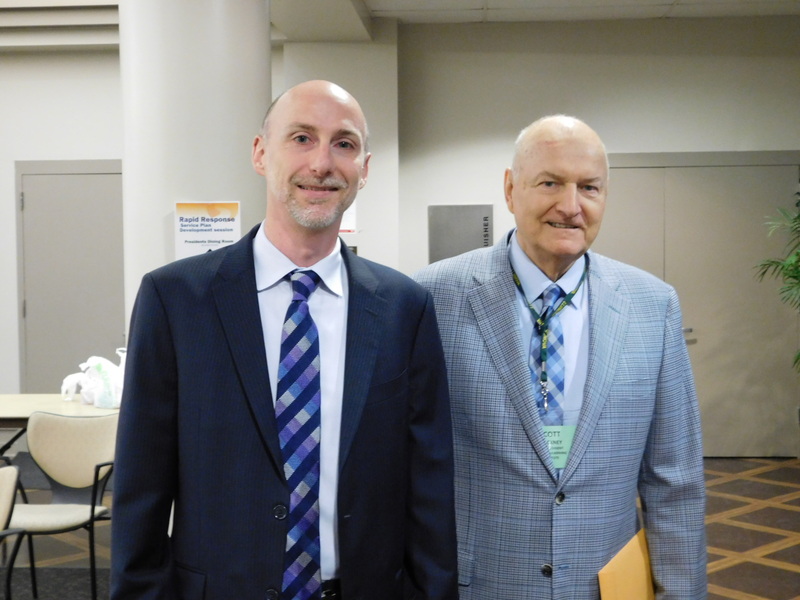 At the October 2015 Forum, Christopher Waldrop (on left with LLI VP Scott Pinckney) provided the Food and Drug Administration’s perspective on food safety issues and challenges. 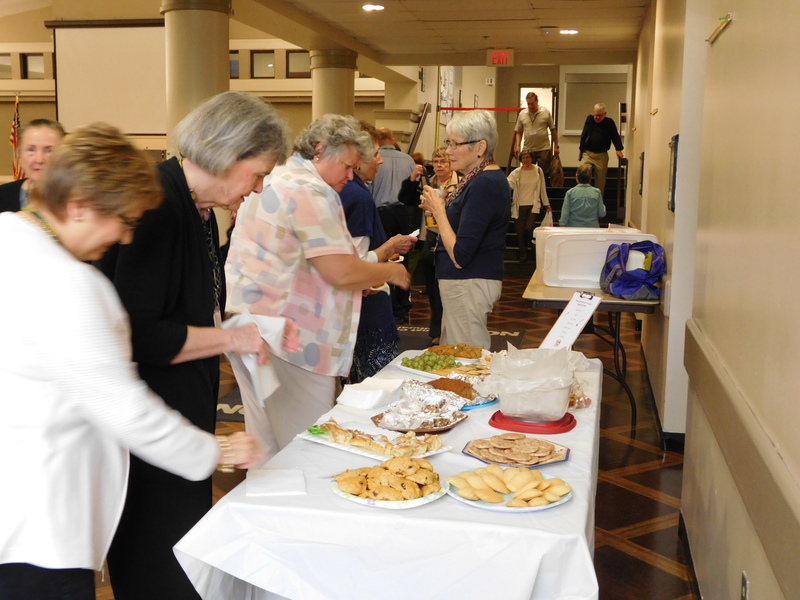 LLI members and guests enjoyed both the informative presentation and the opportunity for fellowship. 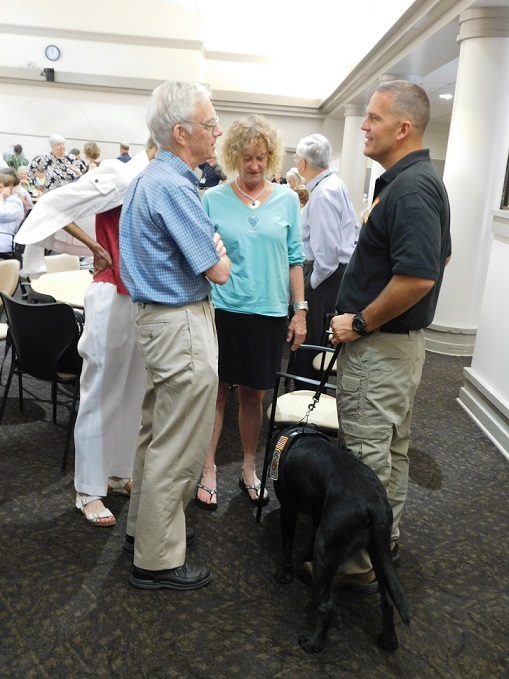 At the September 2015 Forum, Mr. Michael Schaff, Battalion Chief of Virginia’s Urban Search and Rescue Team (Virginia Task Force 1), presented a fascinating behind-the-scenes look at how the team trains and deploys to save lives after catastrophes both here and abroad. 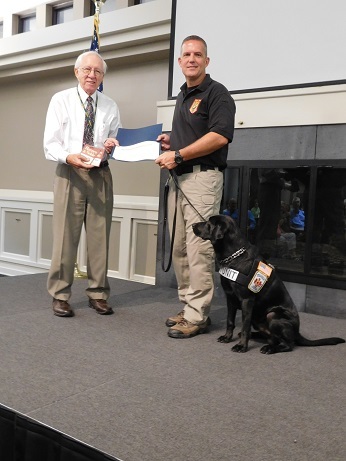 Search dog Phoenix provided his own unique perspective! 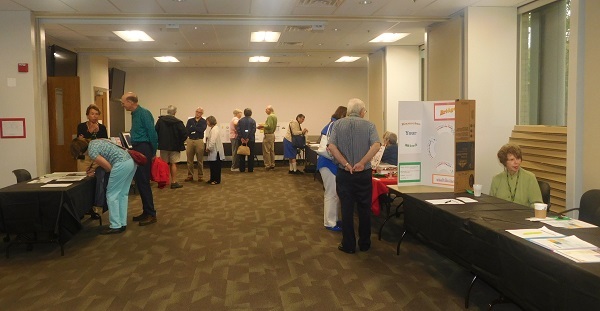 LLI members and guests enjoyed socializing before and after the November 2015 Forum at the Ernst Cultural Center (NOVA-Annandale). 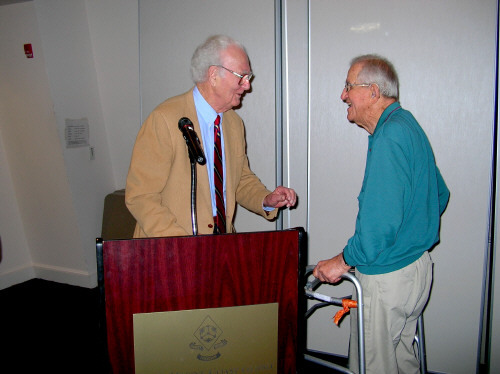 At the November 2015 Forum, Stephen Harding (on right with LLI president George Chalou) provided a fascinating behind-the-scenes look at the craft of historical writing. 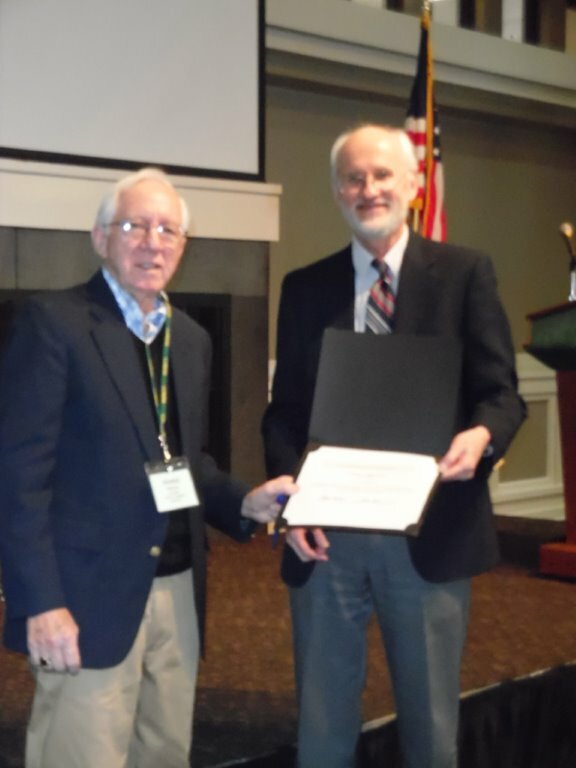 Mr. Harding is the current editor-in-chief of Military History Magazine. 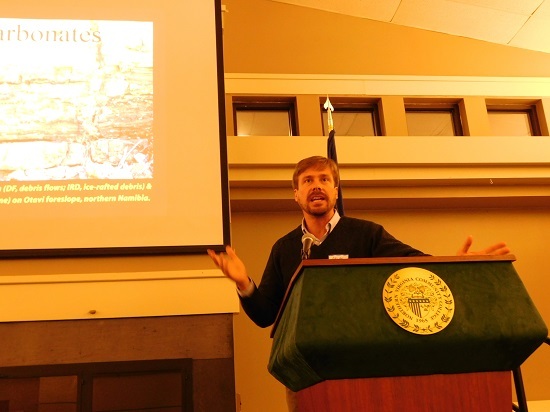 At the January 2016 Forum, Professor Callan Bentley of NOVA-Annandale provided fascinating insights about Snowball Earth and other extreme climatic periods over millions of years that have influenced plant and animal life on our planet. 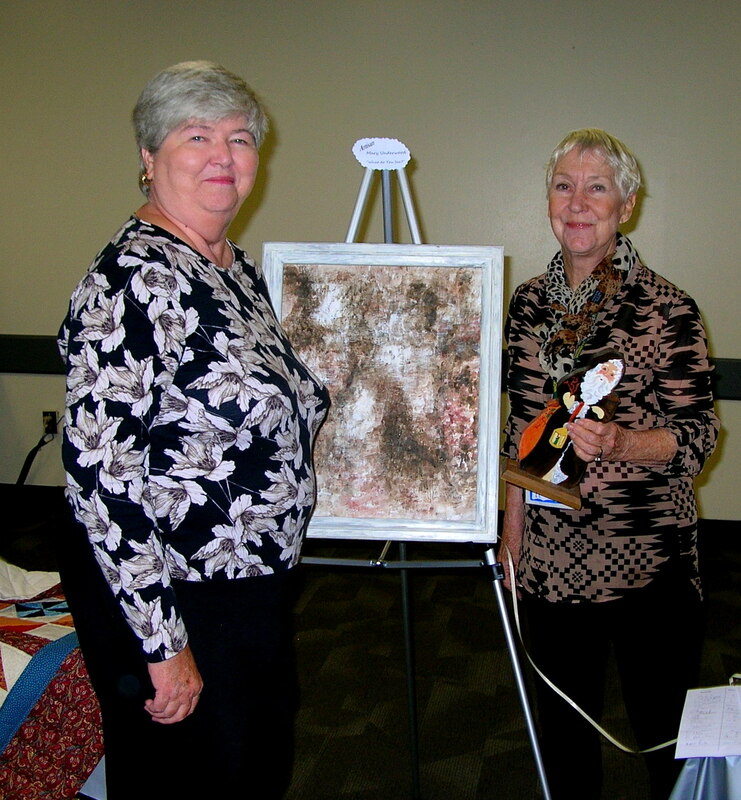 At 2016 February’s Forum Ms. Jane Terry (r) from the National Safety Council provided valuable information about urgent safety issues in our communities, to include the increasing abuse of prescription painkillers. 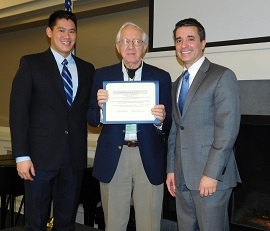 At the March 2016 Forum, physician Dr. John J. Whyte (on right) from the FDA provided fascinating insights and debunked myths about the approval process for prescription and over-the-counter drugs. 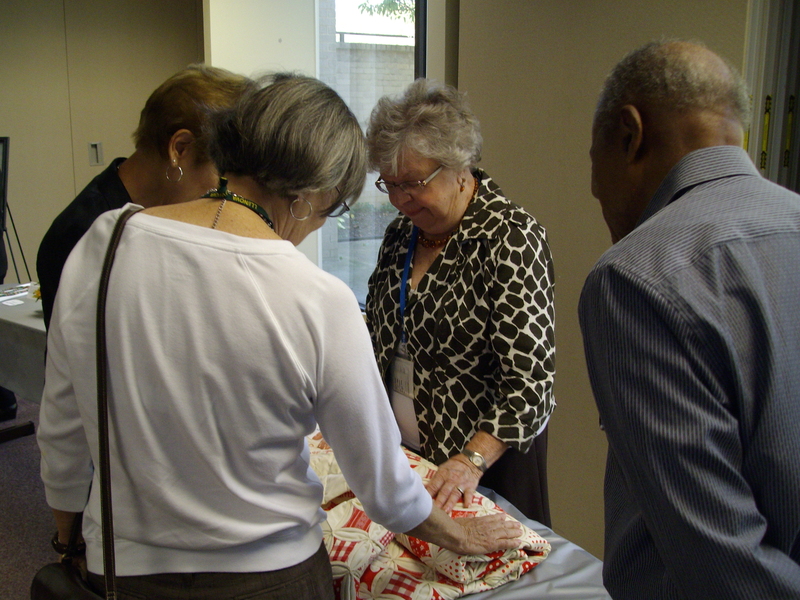 It takes a wide range of LLI volunteers to make our outstanding class offerings happen. 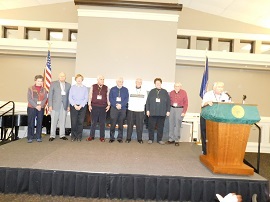 Shown here are core members of the Curriculum Committee at the March Forum. 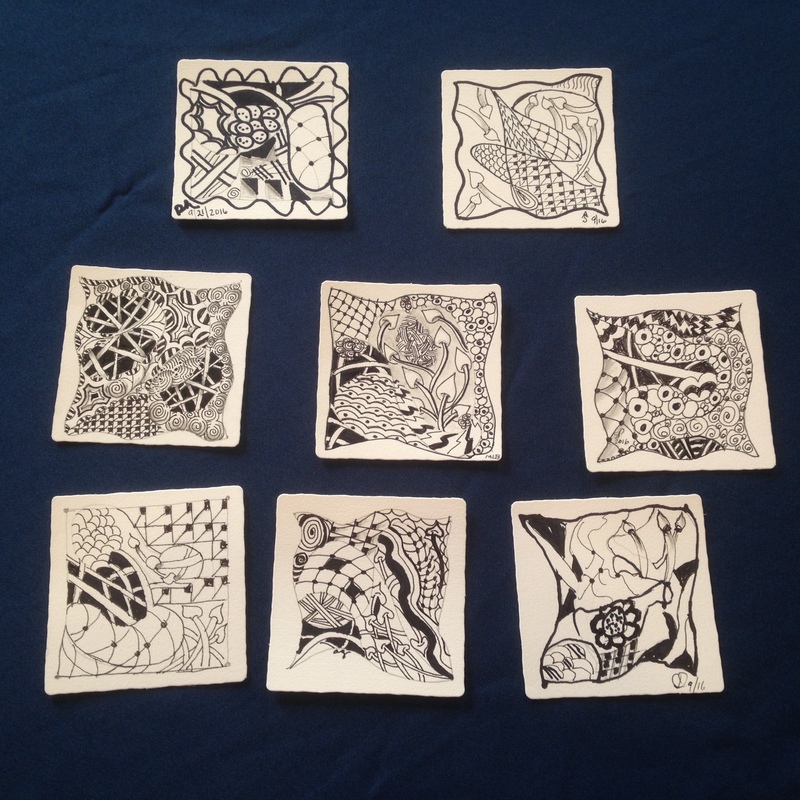 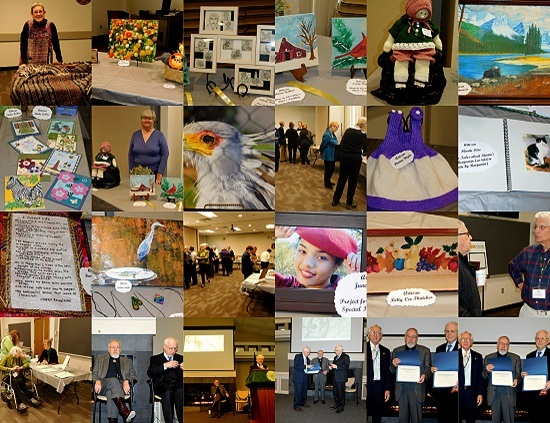 LLI members enjoyed another display of LLI artistic talent at the 2014 Arts & Crafts Exhibit. 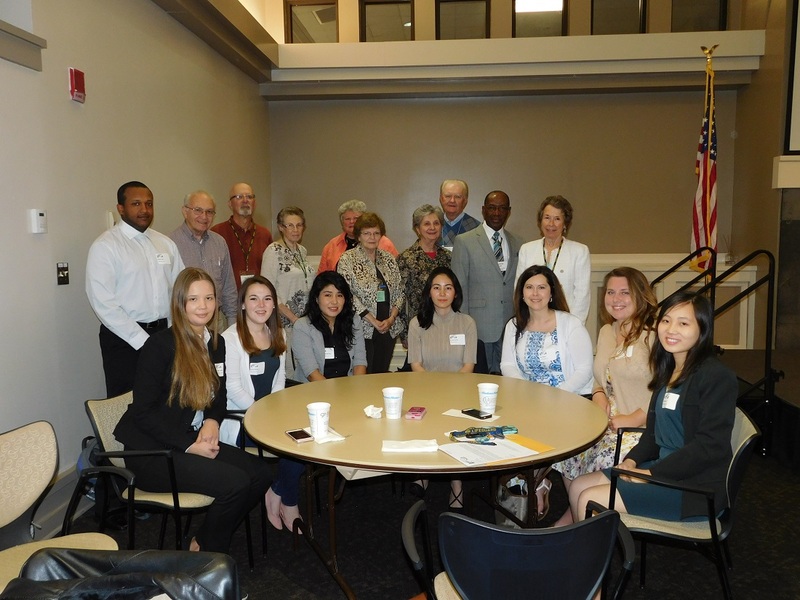 Pictured here are the eight 2016 LLI scholarship winners with members of the Scholarship Committee. 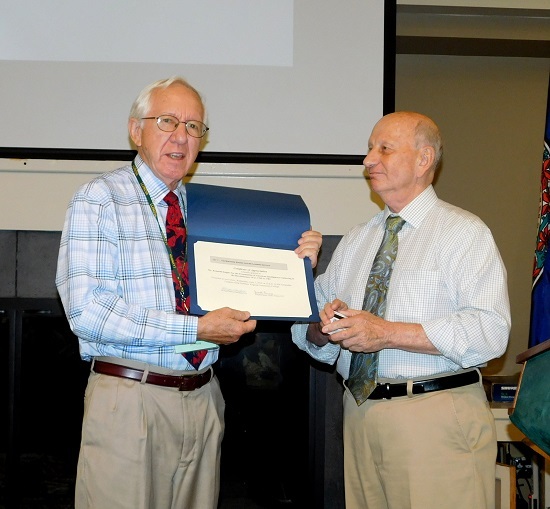 LLI President George Chalou thanks the June 2016 Forum speaker, Kenneth Daigler, who provided a fascinating presentation about intelligence gathering in the Revolutionary War. 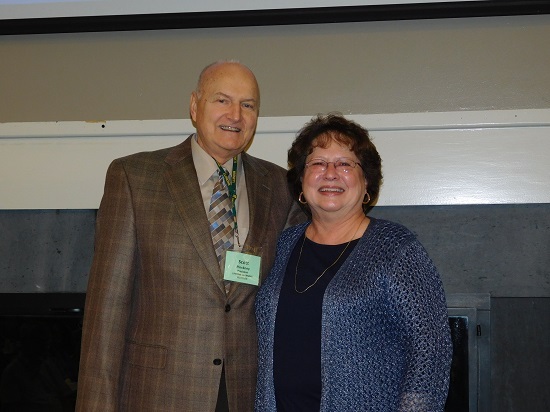 Former Administrator Laura Charron was honored at the June 2016 Forum for her many years of service to LLI. 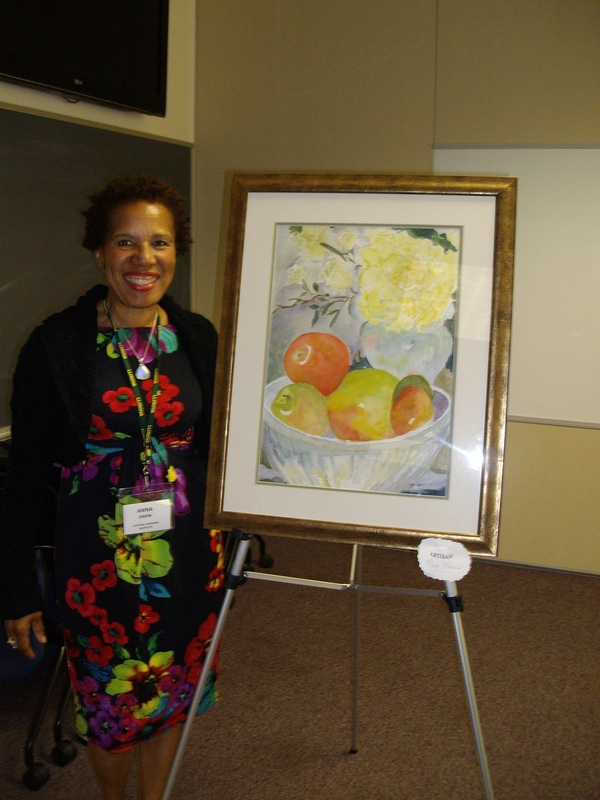 At the October 2016 Forum, clinical nurse Beverly McElroy from the National Institutes of Health provided a wealth of valuable information about Parkinson’s disease and NIH research initiatives. 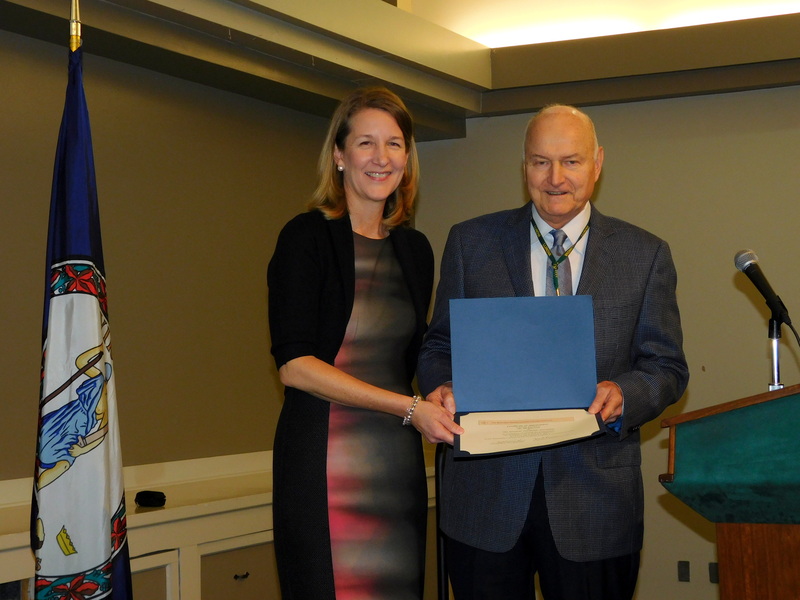 At the November 2016 Forum, prominent historian and LLI member, Dr. Herman Viola, provided fascinating insights about the often overlooked contributions of Native Americans to our armed forces. 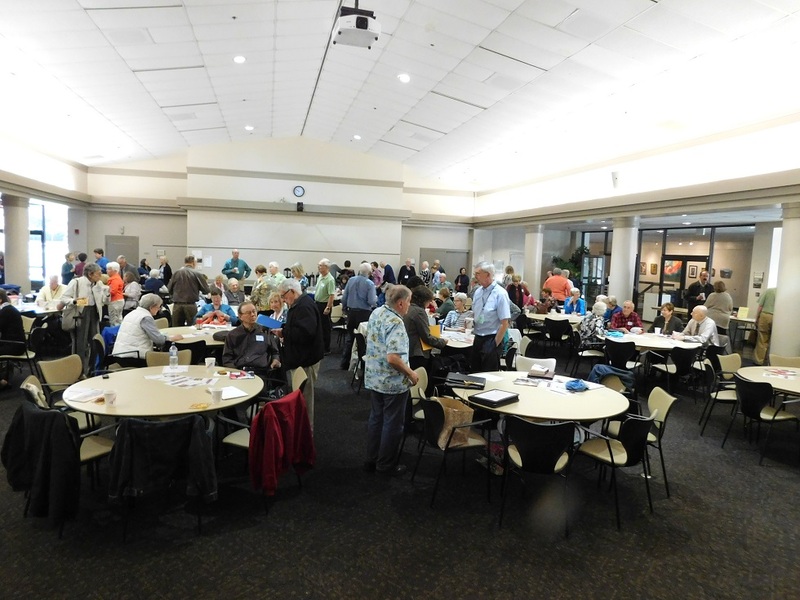 At the January 2017 Forum, Dr. 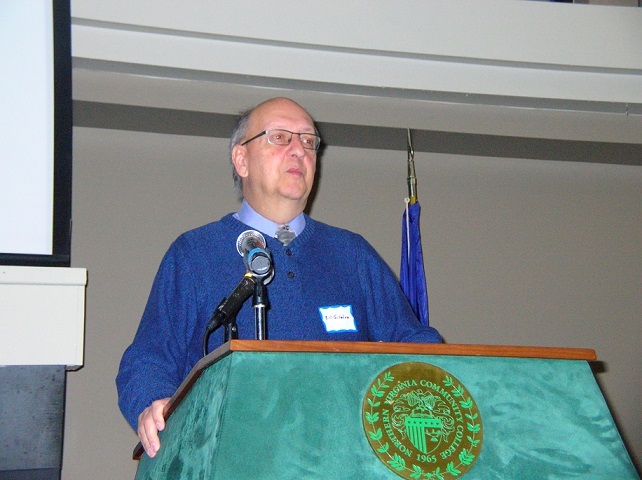 Gridlock (Mr. Richard Thomson), enlightened us on what to expect, and what not to expect, from all the various transportation changes and improvements that are taking place and he touched on some future projects for the area. 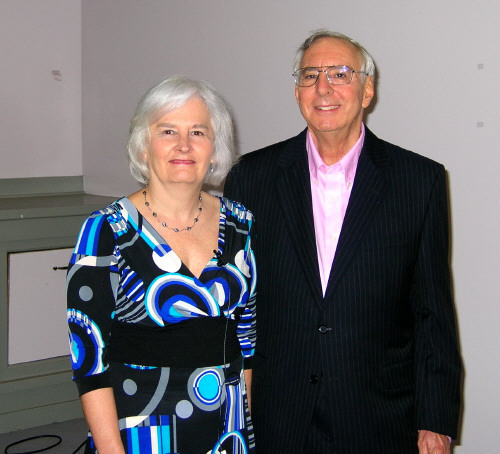 Our February 2017 Forum speaker was Jill Ingrassia, the Managing Director of AAA’s Government Relations & Traffic Safety Advocacy Department. 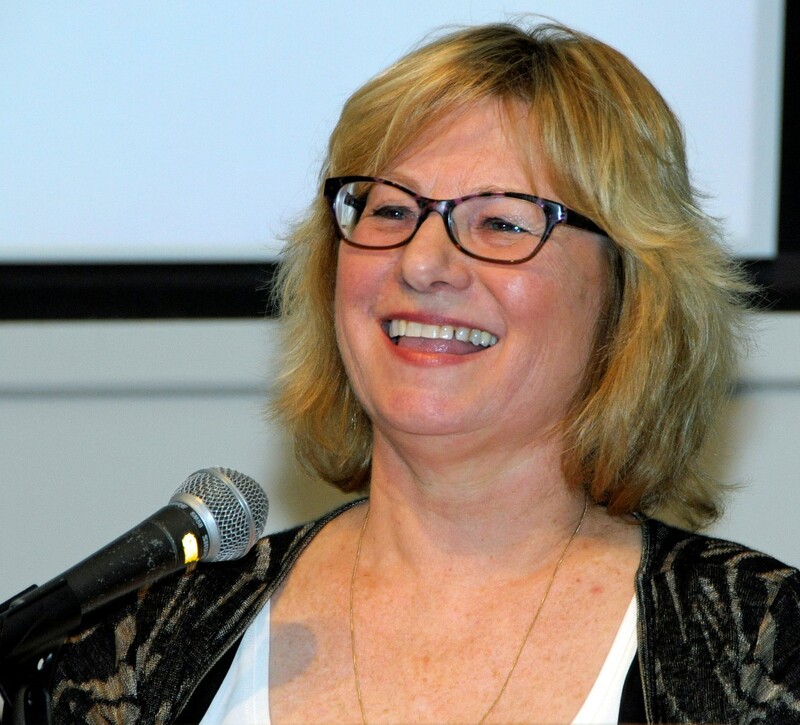 She informed us on what we can expect when autonomous cars become available to the public and some of the shortcomings still to be solved with self driving cars. 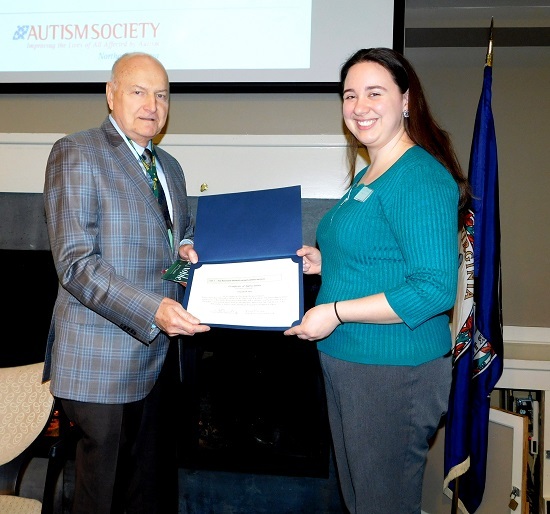 LLI's March 2017 Forum speaker was Elizabeth Roy, Managing Director of The Autism Society of Northern Virginia. 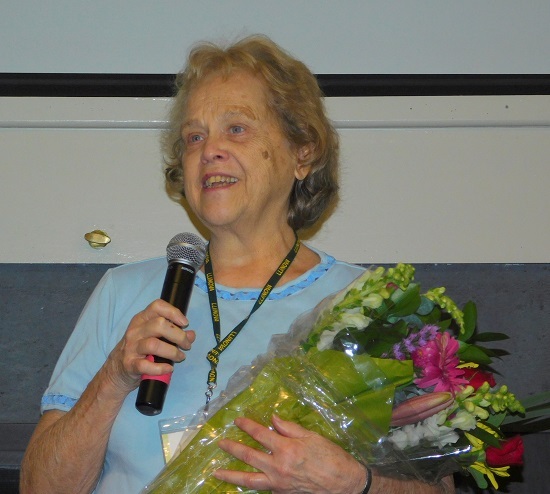 She presented an overview on what Autism Spectrum Disorder is and explained the tremendous challenges this disorder places on the children, their families and society. 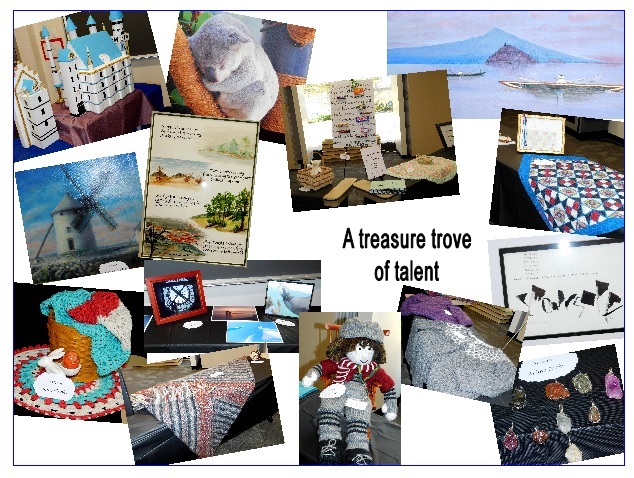 I think we all came away with a greater understanding and appreciation of what is involved with autism. 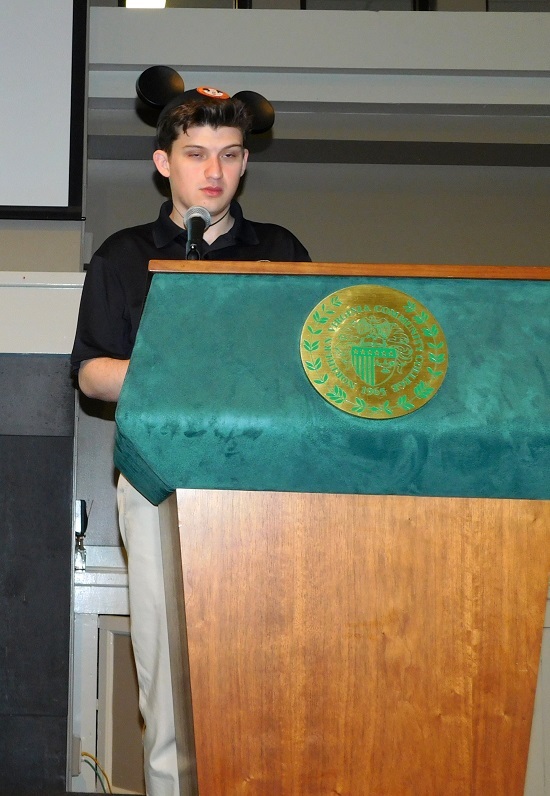 Connor Cummings, who is autistic, gave a heartwarming talk on his accomplishments and activities and the trials he faces in his day-to-day living at the March 2017 Forum. 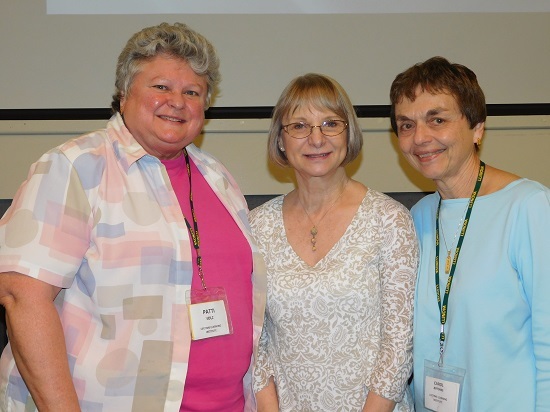 Three new Board members---Patti Volz, Judy Robison, and Carol Jeffords---were elected on June 1st. 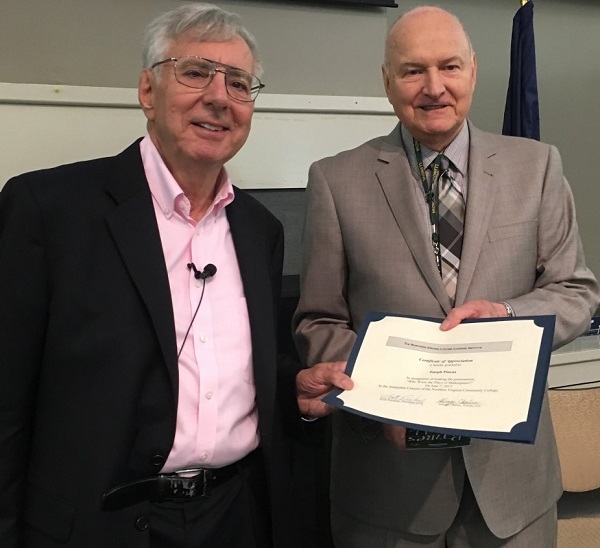 Center> Our April Forum speaker was Professor Bill Schneider, Professor of Policy, Government and International Affairs at George Mason University. 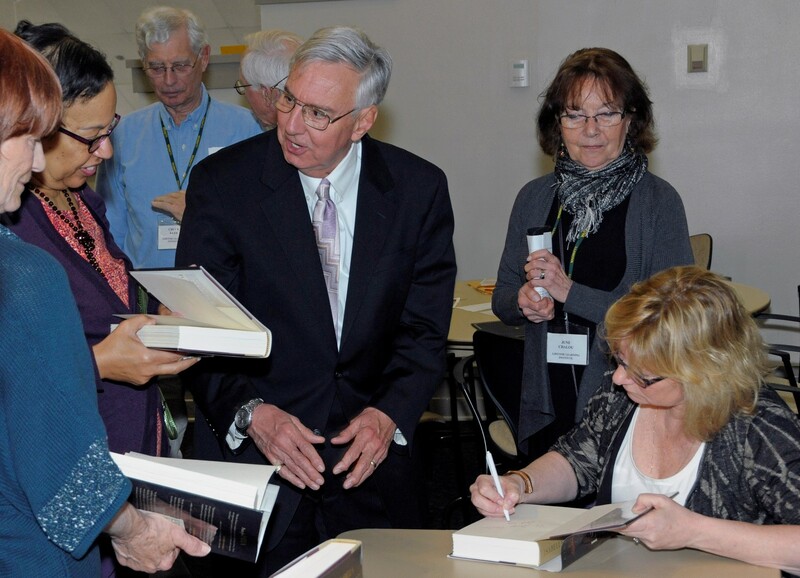 He previously served for 19 years as senior political analyst at CNN, is a published author and the recipient of numerous awards. 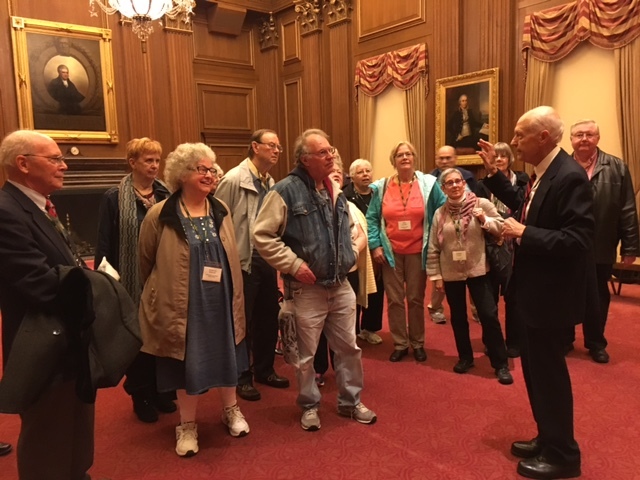 He shared his views on the Post Election Political Scene in the U.S. and Around the World, which was followed by a Q&A session. 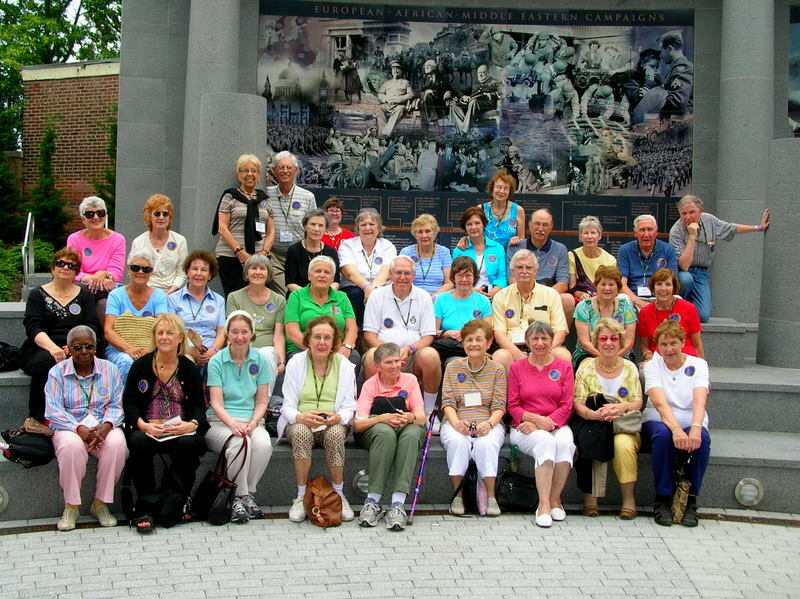 Over the years, we have been very fortunate to have numerous National Park Service rangers present many informative classes to our LLI members. 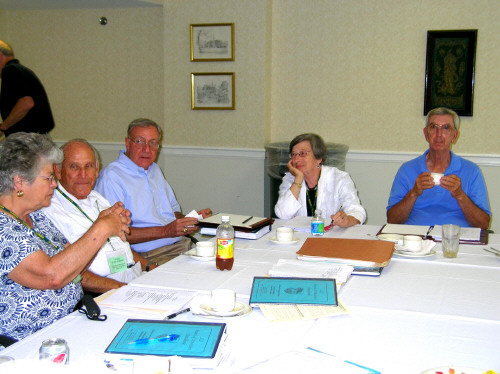 They cover a vast range of interesting historical topics, enjoyed by all those attending. 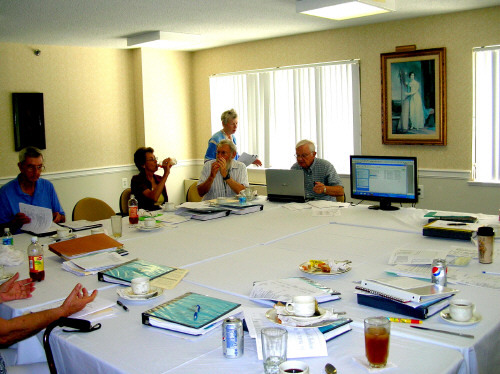 Pictured are Eric Pominville, Bethany Bagent, Heidi Dietz and Brad Berger. 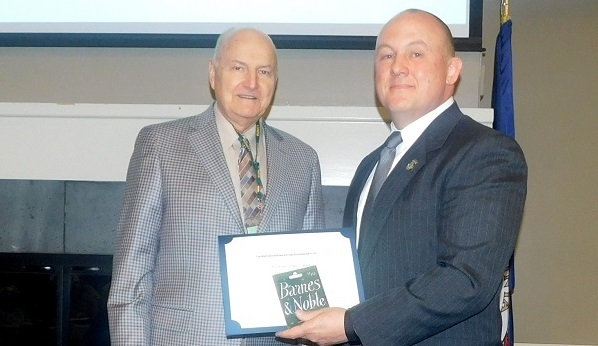 Our May 2017 Forum speaker was author and retired Army Major, Dean Dominique. 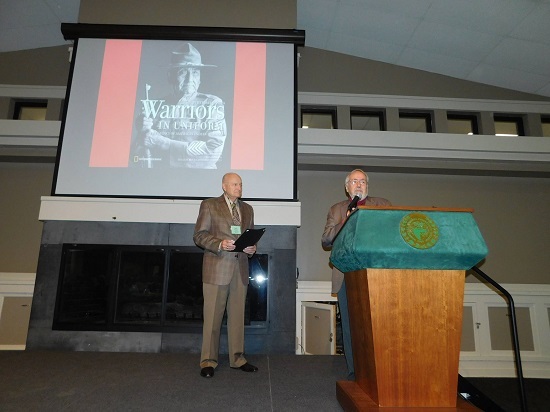 He took us through his lengthy research into firsthand accounts of infantry soldiers who served in General Patton's 317th Infantry Regiment in WWII, thus the title of his book "One Hell of a War: Patton's 317th Infantry Regiment in WWII". 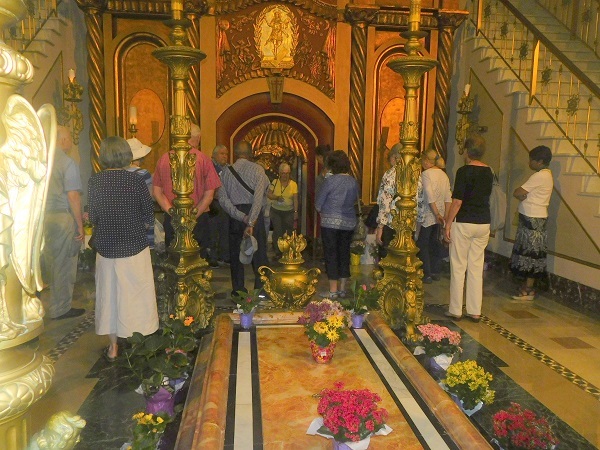 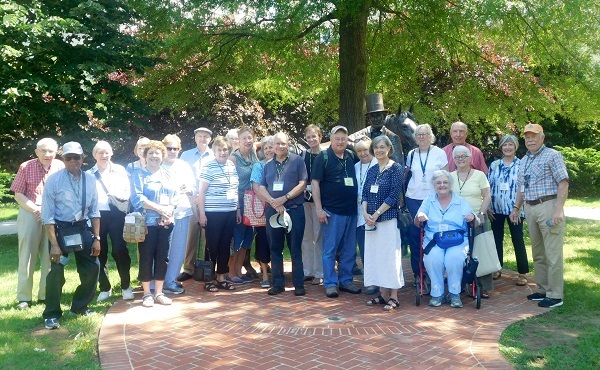 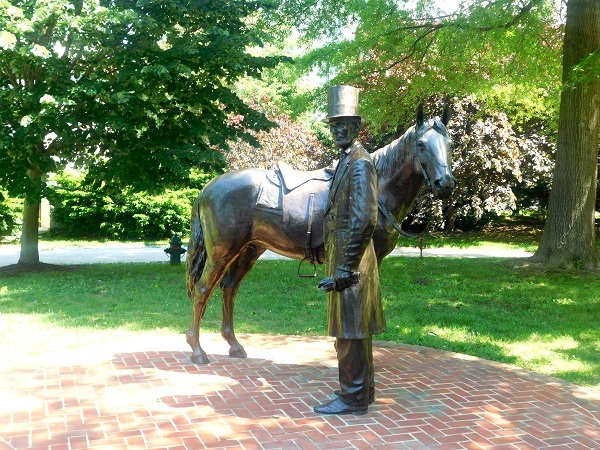 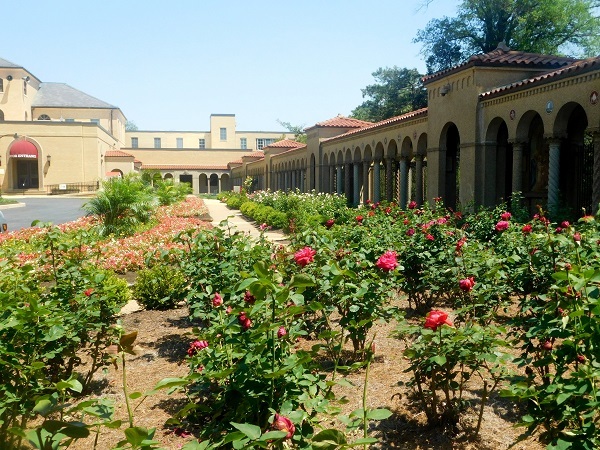 Another LLI day trip was enjoyed by those who toured Lincoln's Cottage and the Franciscan Monestery and gardens. 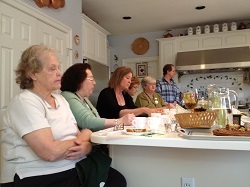 Kyla Lupo teaching one of the Iphone classes Our June Forum speaker was LLI's own Joseph Pincus, who led us through the continuing controversy on who actually wrote the plays of Shakespeare. 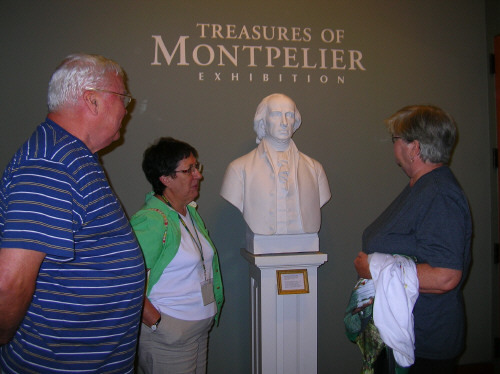 He "wowed" us with his one man, compare and contrast, presentation between the Bard of Avon and the 17th Earl of Oxford. 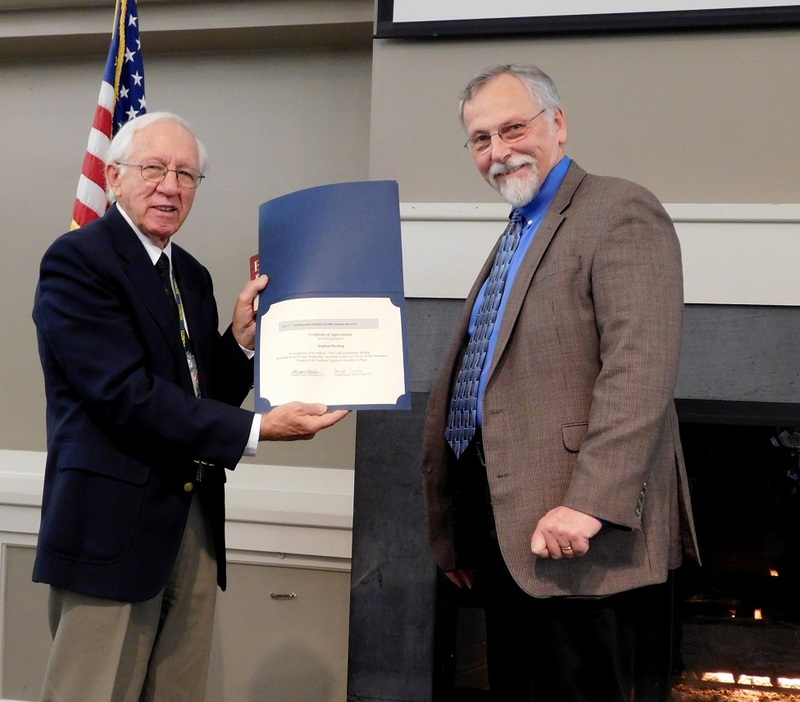 Our November 2017 Forum speaker was Investigative Reporter Walter Pincus. 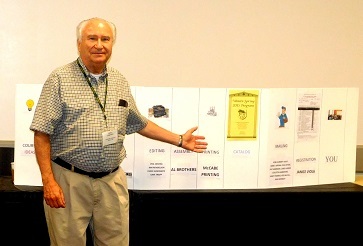 He took us through the many milestone events, past and present, which he has reported on and revealed some of the close associations he had with some of the best sources for information. 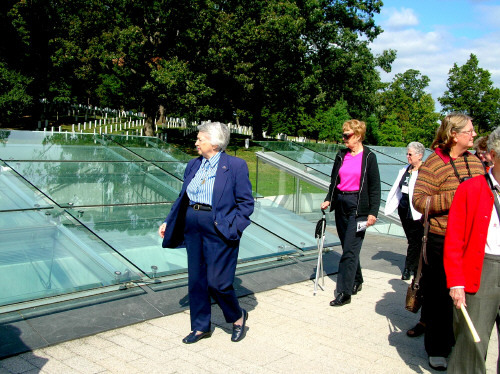 Walter was one of six Washington Post reporters who shared the Pulitzer Prize for National Reporting in 2002. 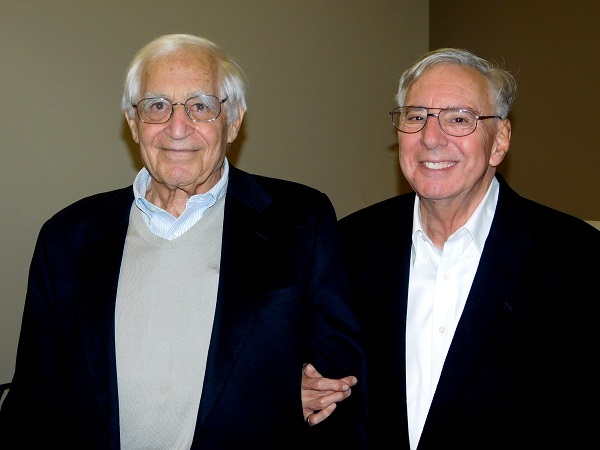 The Pincus Duo - but no relation to each other. 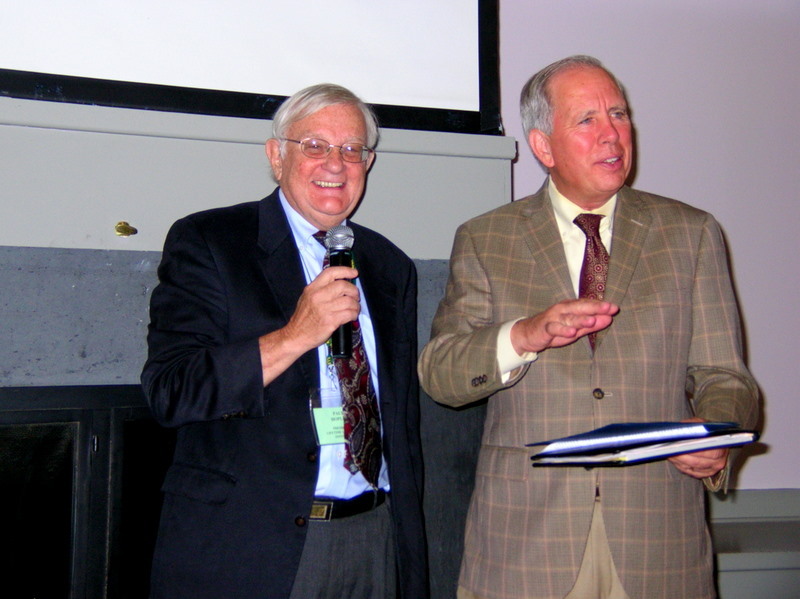 Investigative reporter, Walter Pincus and our own LLI member, Joseph Pincus. 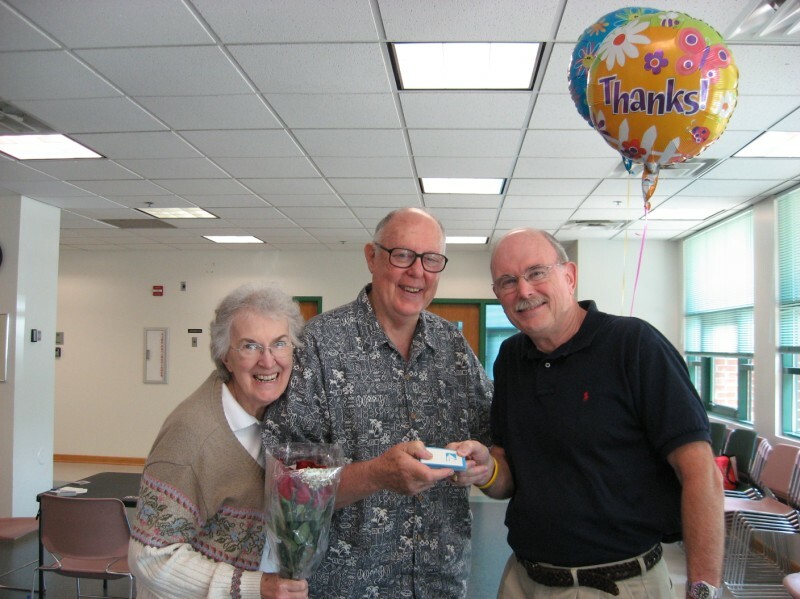 We have Joseph to thank for the wonderful Forum speakers each month. 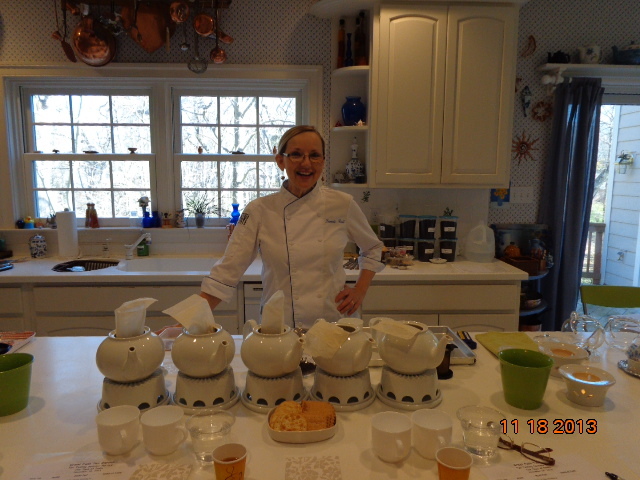 Chef Cal worked his magic and showed us many different creative ways to serve salads at his latest Salads & Plate Presentation class. 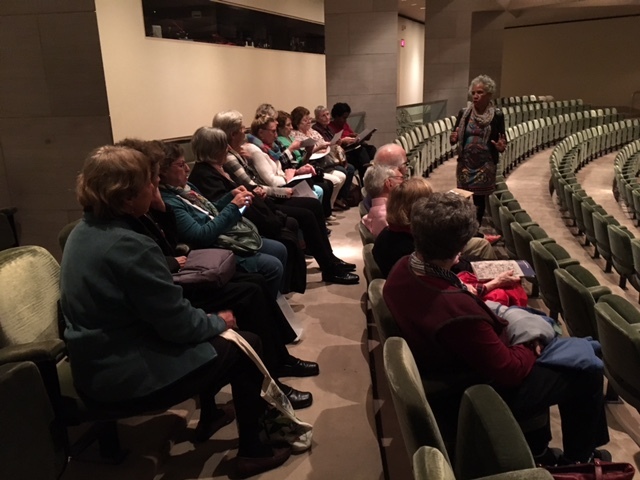 During a recent meetup, LLI member and National Gallery of Art docent, Anna Dixon, is shown briefing some of our members on the Bazille exhibit. 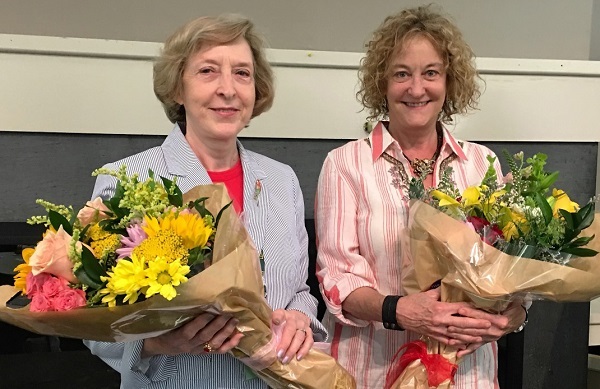 Bouquets were presented to outgoing LLI Board members at the June Forum, Delsa Hildebrandt and Susan Alexander. 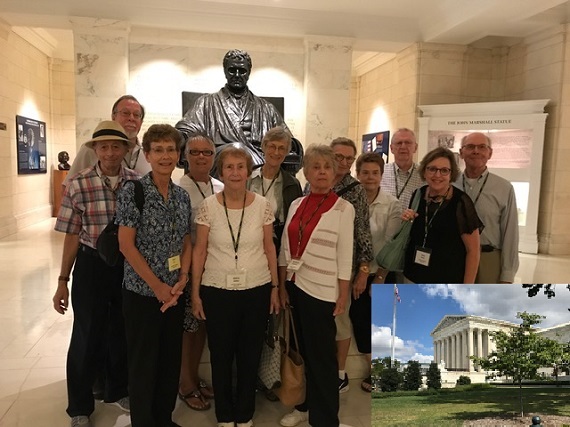 LLI group at the Supreme Court of the United States. 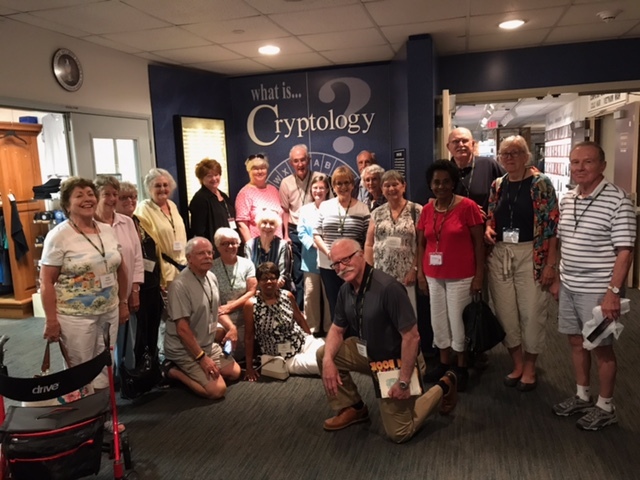 LLI's field trip to the National Cryptologic Museum kept the group fascinated as guide explained the many cipher devices that have been used for capturing and encrypting information through the years. 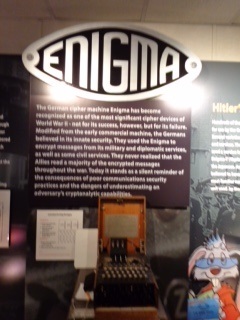 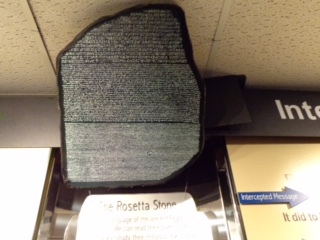 Some of the items seen at the museum were versions of the Enigma machine and a replica of the Rosetta Stone.